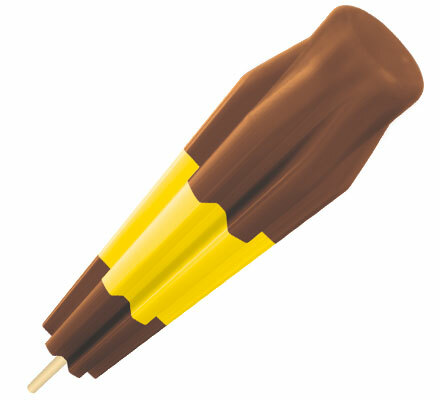 Chocolate fudge and banana fudge in the iconic Bomb Pop® shape. Ingredients: Skim Milk, Whey, Sugar, Milk, Corn Syrup, Buttermilk, Contains 1% or less of Cocoa, Cocoa Processed with Alkali, Natural & Artificial Flavor, Coconut Oil, Guar Gum, Cellulose Gum, Xanthan Gum, Mono & Diglycerides, Yellow 5, Annatto for Color. Allergen Information: Contains Milk. May contain Peanuts.